Leonardo da Vinci was not a prolific artist. In a career that lasted nearly half a century, he probably painted no more than 20 pictures, and only 15 surviving paintings are currently agreed to be entirely his. Of these, four are incomplete. 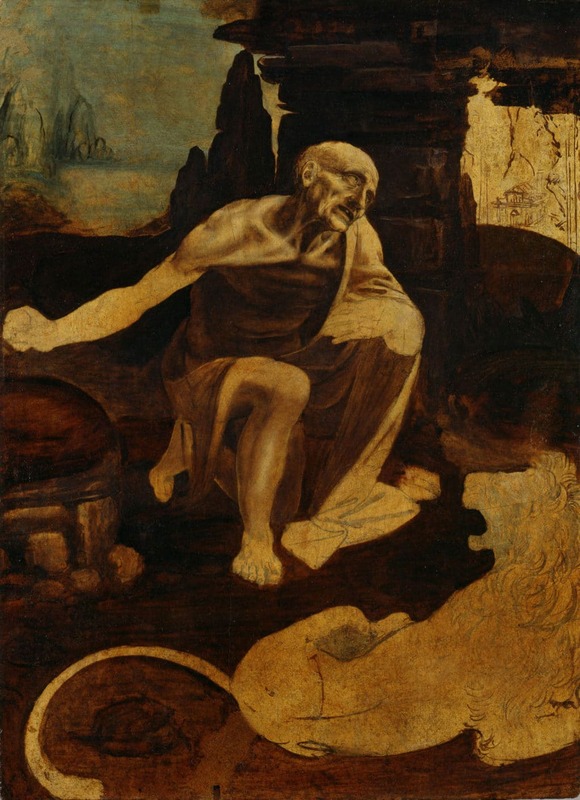 One painting, abandoned by the artist but currently hanging in the National Gallery, is so far from being finished that the two figures in it, that of Saint Jerome and the lion in the wilderness, have been barely touched by paint. The gesture is compositionally dynamic, since the outlines of the saint’s body are echoed by the lion at his feet – both jaws are agape, and the heads of beast and man meet in a diagonal line. Yet the dramatic gesture does something else. The saint’s posture allowed Leonardo to explore pictorially what he had investigated as an anatomist. Anatomical and écorché studies of the skull and neck of an old man feature in this exhibition, and although they are not direct studies for this unfinished painting, the treatment of the neck muscles is very similar. Once his pictorial investigations were complete, there is every chance that Leonardo’s restless intellect wanted to move on. In fact, Leonardo was fairly notorious for not completing commissions, and there are stories of wrangles with dissatisfied patrons. He is also known to have been a terrible procrastinator – paintings would often be worked on in fits and starts, often over several years. 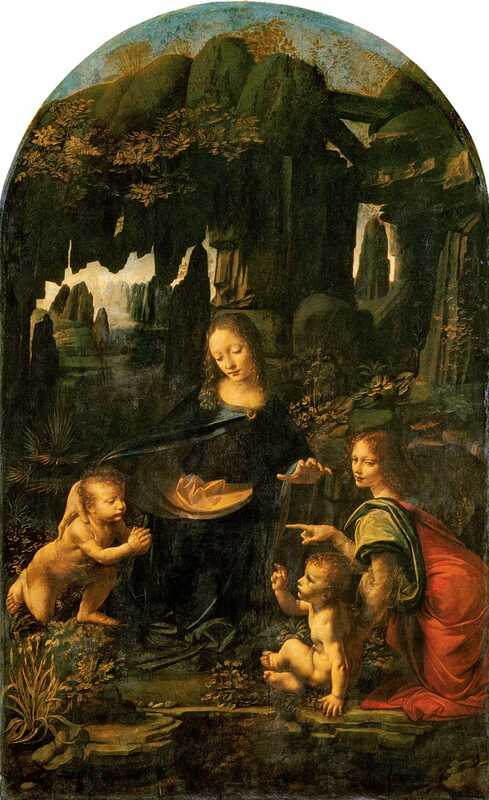 The National Gallery’s version of The Virgin of the Rocks, for instance, was begun in about 1491-2, but wasn’t completed until 1506-8. However, the angel’s pointing finger seen in the earlier Louvre version is missing in the London version, suggesting that, rather than a change in composition, it may not after all have been completed, even after that 14 year gap. For Leonardo, it wasn’t the craft of painting that held the most fascination, but the investigation into observable nature and its underlying principles. Painting as a profession was subordinate to the service of intellectual enquiry, and many of his drawings serve not as preparatory sketches for works of art, but to illustrate other interests – in engineering, in hydraulics, in anatomy, in optics. The sheer scope of his intellect can be found in his notebooks – thousands of pages in his close mirror writing. 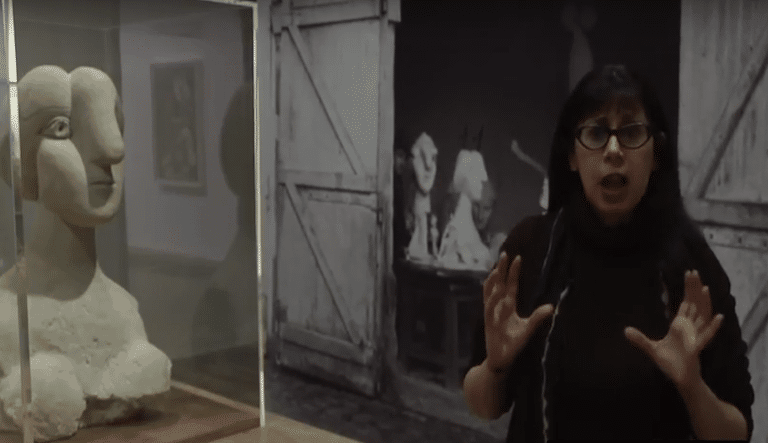 Yet the National Gallery’s exhibition is the first ever to concentrate on Leonardo solely as a painter, not as a scientist or engineer or inventor of proto-helicopters or war tanks. And in so doing it brings together nine paintings produced in the years which saw him radically break with convention, introducing a startling naturalism to portraiture and bringing a dream-like, numinous quality to religious subject matter. These are the years in which he served as a court painter to Ludovico Maria Sforza, il Moro (“the Moor”), in the last two decades of the 15th century. These works, rarely or never before seen together, are shown among Leonardo’s numerous preparatory sketches, which range in detail from rapid doodles made on the edges of scraps of paper to the meticulous and voluminously rendered. They are also shown alongside the paintings of a number of gifted followers, including Boltraffio, Leonardo’s most talented Milanese pupil. 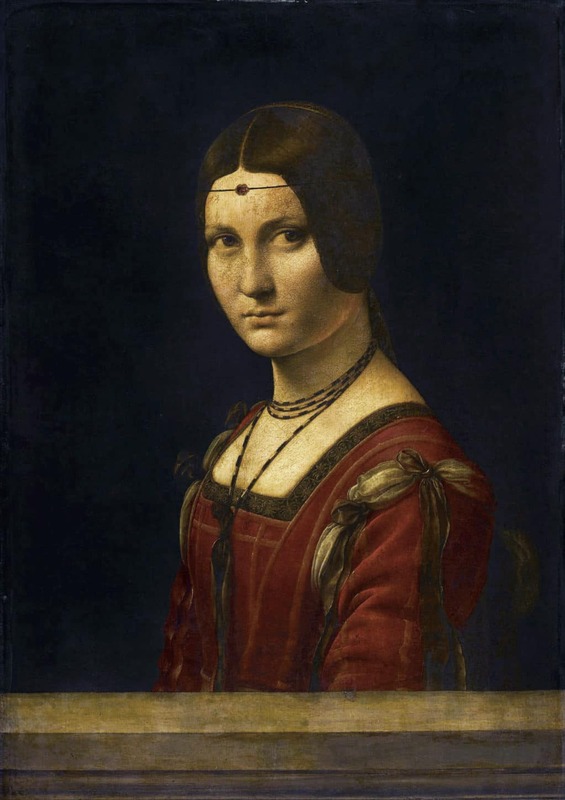 Indeed, among the three portraits on view in this exhibition, Leonardo’s Portrait of a Woman (“La belle ferronnière”) has often been attributed to this younger artist. La belle ferronnière (1493-5) – so called because it was once mistaken for a portrait of the celebrated mistress of François I, but now thought to depict Lucrezia Crivelli, mistress to Ludovico – is depicted in half-length. This is in keeping with all of Leonardo’s portraits (of which only five are known). She is distanced from us by a parapet, and the whole picture speaks of distance and detachment. Her compelling gaze seems at first to hold ours, yet look closely and you’ll find that she is not interested in us at all, but is looking somewhere just beyond us. She is rendered with incredible attention to texture and light, with the modelling of her face executed with great subtlety. But hers is an idealised, almost generalised beauty. Though disdaining ours, La belle ferronnière’s cool gaze may just have settled on the youthful beauty of Cecilia Gallerani, The Lady with an Ermine (1489-90), who hangs on an adjacent wall. And well it might, for Gallerani is not only undoubtedly the exhibition’s showstopper, a striking and breathtaking beauty, she was also the Ludovico’s mistress when it was painted. Departing from the strict profile pose traditionally used for Milanese portraits, she is seen in semi-profile, in a contrapposto pose. This lends a sense of movement and it also shows off the smooth length of her neck as she turns her head to gaze at something or someone outside the picture frame to her left. The line of Cecilia’s neck and head echo the sinuous line of the ermine’s long body, as do her eyes, directly in line with the creature’s, which is larger and more muscular (look at its forelegs) than it would be in real life. 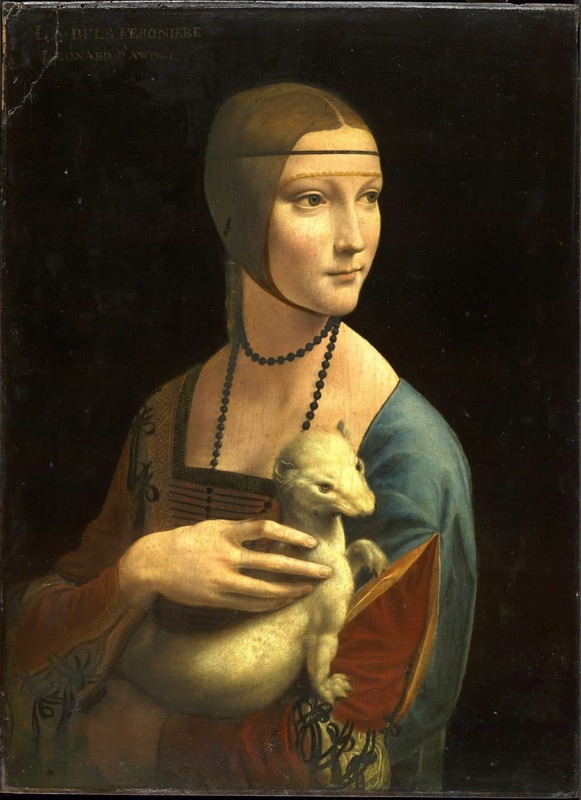 Furthermore, the ermine, which is both a pun on the surname Gallerani and a reference to her lover (bestowed the Order of the Ermine by the King of Naples in 1486), is also an emblem of Cecilia’s purity, even though this 16-year-old mistress of the Duke may have been pregnant at the time the portrait was painted. That small, exquisite portrait may easily rival the later Mona Lisa, and to see the two Virgins of the Rock, facing one another in the same gallery is a further reminder that such encounters are a once-in-a-lifetime pleasures. With its dull glaze lifted in a recent restoration, the London version is now much brighter, its burnished colours coming through most brilliantly in the Virgin’s cloak and in the detail of the foreground foliage, as well as in the blue haze of the background. The Paris version, however, remains the sweeter and more naturalistic. Finally, we have Christ as Salvator Mundi, painted from about 1499 onwards. This recent attribution, which is held in a private collection, shows the saviour Christ with his right hand held in a blessing, while the left holds a crystal orb. The tiny bubbles beneath the orb’s clear surface are painted with astonishing skill, but in contrast to its clarity, Christ’s face is seen as if through a gauze – as if, as the catalogue suggests, his face is imprinted on the veil of Saint Veronica or the cloth of Mandylion of Edessa. To enhance your engagement with this great master of the High Renaissance, I would recommend the hugely informative exhibition catalogue.